The Ginger jeans pattern was on my radar from when it was published, I loved the skinny version but just didn't see myself making it. I already have skinny jeans that fit, but prefer more boot cut jeans. But when I first eyeballed the flares expansion, I nearly fell of my seat! Big 70s flares a la Led Zepplin - yes please!! First thing to do was find the fabric. I spotted this pair that Maeve made on Dress Fabrics blog, and ordered the fabric from the shop. This fabric is gorgeous, it has 5% stretch and the colour is lovely. The zip came from my stash, buttons and rivets from ebay (more on them later), and the pocket lining was left over fabric from this dress. It turns out that I have a lot to say about these so I'll break it down. Using the finished measurements on the pattern, I picked the closest size, and drew in the stitching line on my pattern (which was the PDF so I was happy to scribble on it). From this I was able to work out the above measurements on the pattern, which, happily, turn out to be pretty much the same. I then ruled a line 2 inches above and below the knee - it was 2 inches because that's the width of my ruler. I then shortened crotch to knee, and knee to hem to my two measurements. I had to redraw the cutting lines, but below the knee they matched exactly with a smaller size, so it was easy. Sewing these was really easy as the instructions are brilliant, as is the sewalong. The only thing I would do differently, and I'm being really picky, would be to shorten the width of the interfacing on the right front zip extension. The instructions say that when you have attached the zip guard to the right fly extension, you then trim a bit off the edge. Which I did, but then the edge of the interfacing was showing behind it. I added some bias tape as suggested in the instructions, but next time I will make that bit of interfacing narrower. You can just about see the interfacing at the bottom right of the zip extension. 2. 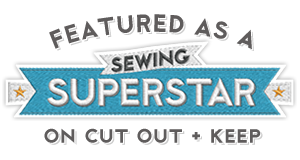 When you basted the outside seams together to check the fit, and lowered the thread tension to make removing the basting thread easier, REMEMBER TO TURN THE THREAD TENSION BACK TO NORMAL!!! I forgot. Then tried to sew on a back pocket, then wondered why my machine, and then I, were having a total meltdown. Top stitching the belt loops wasn't fun either. It really didn't like all the bulk at the top of the waistband (the bottom of the loop was ok). So I threw it out to Instagram, and both Manju and Nicole suggested using normal thread in the same colour as the top stitching thread. This is genius people. Genius!! The two top stitching thread belt loops took forever, with much unpicking - the four normal thread belt loops took ten minutes and not a stitch ripper in sight. 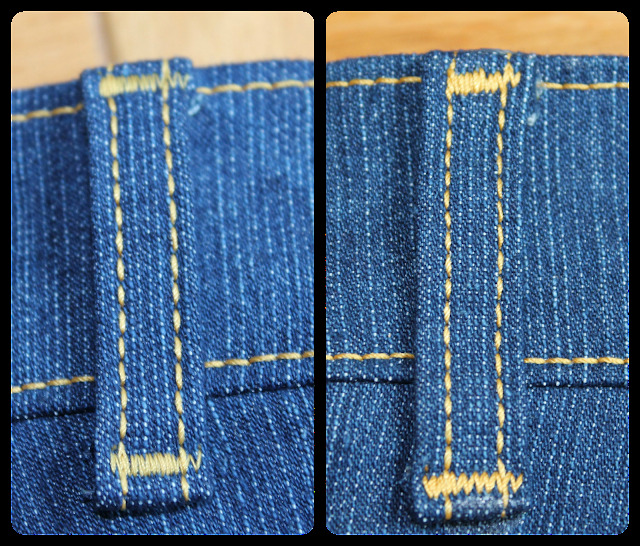 The belt loop on the left was stitched on with normal thread, and the one on the right with top stitching thread. The pattern calls for five belt loops, but I used six because I wanted two on either side of the centre back instead of one on the centre back. You can see that some of my top stitching is coming undone in the centre back seam, but I'm still waiting for another spool of thread that I ordered on ebay, then I can fix it. There was much procrastination about the design for the back pockets. In the end I took inspiration from this pair made by Heather Lou, and used a loop decorative stitch that is on my machine. I also used it on the inside at the top of the right leg, and bottom of the left, because - why not? I wish Heather Lou had posted this before I started the top stitching. The bit about the stitch ripper nearly made me choke on my tea when I was reading it on my phone in work!! Wise words people! The pattern calls for a 5 " zip, which I bought, but I had a 4" zip in my zip box and it turned out to be the perfect length. Which is just as well, because I didn't fancy having to shorten a metal zip. I had got some random buttons and rivets on ebay, but they turned out to be rubbish. Three of the buttons bent or broke when I was hammering them in, and in the end Andrew put the fourth one in using a vice. The rivets refused to attach at all. Again I threw it out to Instagram, and Sian suggested MacCulloch and Wallis, but the postage turned out to be nearly the same as the buttons and rivets! Maeve suggested Hemline buttons, so I got some of them and some rivets. Making jeans gets a bad rap as being difficult, it really isn't, but I'll tell you what is - putting in those blinking rivets!! The best thing I found to use was one of these hole punchers for putting holes in belts. 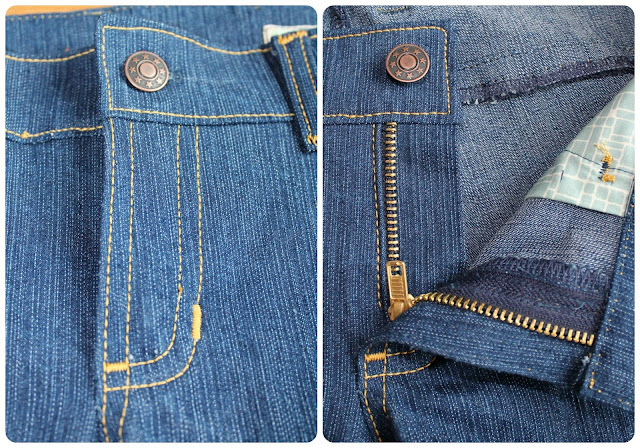 I have only put three rivets in at the coin pocket and outside edges of the front pockets. I'm going to see how they hold up in the wash before I put them on the back pockets. I absolutely love my jeans! They are so 70s that I had to get my big 70s sunglasses out. Oh wow, these look great! great fit and that little topstitching detail looks so smart! Wow these are a great shape on you. Great job! Thank you! And thanks again for the tip on the belt loops! Totally fabulous jeans! Thanks for such a detailed post. Wow, so impressed!!! What a fab job you did, too! Great attention to detail. So now I'm off to make a jeans skirt for one of my daughters. You are such an inspiration! Thank you! I just love the 70s styles, as I'm from the 70s myself! These are FREAKING AWESOME! I have been toying with the idea of making jeans but these have done it...they deserve a WHOLE LOTTTTTTTA LOVE! Perfect style, great look. Ya baby, gotta go get my zippo, turn it up & make these bad boys! Thank you! Whole lotta love - see what you did there!!!! Honestly, making jeans was nowhere near as hard as I thought it would be. Fabulous. Great top stitching and love the little details. Also really love the fit on your shirt. Your jeans are amazing and the top too! Love your whole outfit!!!!!! I have been following your progress on Instagram and am in total awe. They are just amazing. I should learn how to make them too being tall! Thank you! I find there will be a choice of about two styles of jeans in petite, I'm guessing it's the same in tall sizes! Thank you! The top stitching worked out the way I wanted it in my head! Wowie - these are amazing! So impressed that you have made jeans!!! I love the flared version of the Gingers too, but I also have my eye on the Birkins.....would love to make a pair of jeans sometime. But I doubt I will, I have no time anymore these days. 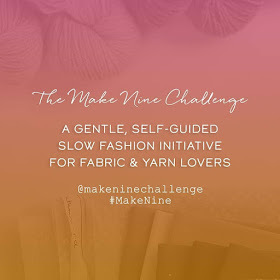 However, I'm definitely going to bookmark your post to refer back to should I find some jean making time. Ps. I'm pretty sure I said this on Instagram, but I just love the little stitch details that you put on the pockets and some of the seams - such a fun little detail, its the kind of thing that makes making your own clothes so worthwhile! Thank you! I liked the Birkins too, but decided on the Gingers because there were two different rise heights, and I also like the skinny version. I'm not going to lie, they did take a while to make, but now that I have a fair idea about what I'm doing, I know the next pair shouldn't take so long. Also, the instructions and sewalong are just brilliant, and that helped a lot. I could definately make another pair quicker that I could make a shirt dress. I love the stitch details too!! I got a fancy new machine in January, and as it has all these lovely stitches, it seemed a shame not to use them!